A clip worthy of goosebumps and optimism. In less than a week, July 14 dawns with New Horizons orbiting Pluto at 12,500 kilometers. One of New Horizons niftiest capabilities comes from LORRI – Long Range Reconnaissance Imager, a remarkable high definition camera. Take a few minutes to watch this video from the National Space Society. 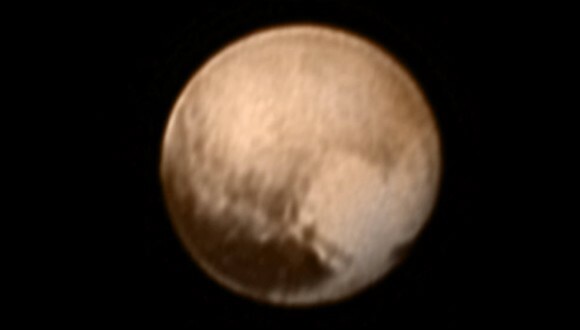 Image taken on July 7 at a distance of 8 million kilometers by LORRI. When New Horizons reaches closest orbit on July 14, resolution will be 500 times clearer. Of interest are the elongated dark spot (dubbed – the whale) and heart shaped bright spot. This is the same view New Horizons will concentrate efforts on July 14. The “whale” measures 3000 kilometers, the “bright spot”, roughly 1,200 kilometers across. “The elongated dark area informally known as “the whale,” along the equator on the left side of the map, is one of the darkest regions visible to New Horizons. It measures some 1,860 miles (3,000 kilometers) in length. Directly to the right of the whale’s “head” is the brightest region visible on the planet, which is roughly 990 miles (1,600 kilometers) across. This may be a region where relatively fresh deposits of frost—perhaps including frozen methane, nitrogen and/or carbon monoxide—form a bright coating. Ponder New Horizons, a little probe nine years and five billion kilometers from Earth, traveling at 49,600 Kph., about to settle into orbit 12,500 kilometers above Pluto. If that doesn’t raise your holy crap meter, nothing will.